The recent cold spell has given way to slowly rising temperatures and before we know it, it will officially be springtime and with that comes the rain. The Highway Code sets out a few basics for wet weather driving, but we are going a step further this month by letting you know what you need to be aware of and giving you some tips and tricks to have up your sleeve should you get into problems. 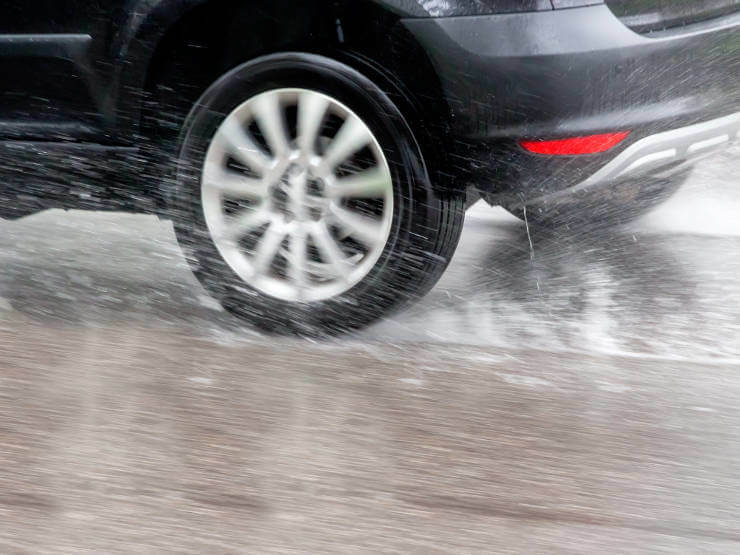 It sounds obvious, but there are plenty of drivers who think they can control a car even if it is aquaplaning. Unless you are a F1 driver, you can’t. So keep a good distance between you and the vehicle in front. A typical stopping distance in the wet is double what it will be in dry conditions, so give yourself plenty of space to react to anything happening up ahead. Water can get into the brakes and steering causing them to be unresponsive when you need most them. Stay alert to any changes in steering; if you feel it change, ease off the accelerator and gradually slow down to give your tyres a chance to get a grip of the road again. Whatever you do, don’t stamp on the brakes or you will lose control of the vehicle. If your brakes are not responding then they are most likely too wet to work properly. Gently pump them so that you evaporate any water off by creating a little friction and they should be fine after that. If you are driving long distances without needing to use your brakes, then gently press down once in a while to check that they are working and are not wet; you don’t want to find that you have wet and unresponsive brakes if you need to use them in an emergency. A very useful feature, particularly for long distance driving, keeping the cruise control on in the wet can actually increase your chances of losing control of your vehicle. For the best grip with the road, turn it off. Driving without it will also give you greater control as you will be able to get a better feel for how the vehicle is responding to the wet conditions. No matter how experienced a driver you are, you can still skid. If you feel that you are going into a skid, take your foot off the accelerator but don’t step on the brakes. Keep looking and steering in the direction in which you want to go and gradually slow down until you regain control. And don’t panic! Crucial when driving in the wet, especially if you are trying to deal with a skidding vehicle, is the rule of doing one thing at a time. Trying to brake, turn, and accelerate again in quick succession will likely lead to loss of control in a way that wouldn’t happen in the dry. Slow down in plenty of time for the turn, take the turn, and then gently accelerate again. For more tips on driving in adverse conditions or for a refresher driving course, talk to us at Lanes School of Driving by calling 020 8166 5678. With 100 years of experience, we continue to keep drivers safe on the road. Let us make sure you are safe too.